O. Warfield, author and poet, wrote the Omar Blue Saga, which includes Omar Blue, K-9 Town, USA, and the new publication Led By An Eagle, to reach out to families, avid readers and dog lovers of all ages. O. Warfield: I live in Richmond, Virginia, with my loving husband and daughter. Accompanied by my daughter, Joy, I offer special entertainment to hospitals and facilities for children and adults with special needs and to seniors in assisted living communities. The events include readings of Omar Blue and a host of gifts and surprises. When did the writing bug bite and in what genre? O. Warfield: When I was a young girl, I wrote short stories. As I got older, I wrote little poems too. No one would see them. It was just something I did. A while back, I started writing poetry for friends. Just to brighten their day if they were having a bad one. Usually silly stuff about something that may have just happened or more serious for something they were going through such as sickness or even death of a loved one. After being told many times how comforting my words were and how I should become a true writer, I decided maybe I should put more thought into what I was writing. In doing that I began to realize how easy and comforting writing is to me. I’m told it’s a rare gift how fast I think up poems and/or stories for almost any scenario but I think it’s just a trait most writers have. I write prose when it better suits the story I’m telling, but my real love is rhymes. My Omar Blue Saga is told in rhymes, with special attention paid to meter and flow. My rhymes don’t distract, they enhance my stories, making them unique. O. Warfield: Until I started writing my books, my only goal was to make someone feel better when they read what I’d written especially for them. My short poems. When I started writing Omar Blue and K-9 Town, USA, my focus was on entertainment and humor. I had a very sick family member who loved animals. At least once a week I’d read what I had completed to her. I wanted everything to end on an upbeat note even though there were serious undertones. My first book is a little more juvenile than the second, Led By An Eagle. It was geared towards family reading, children especially, and included illustrations. I’m happy to say that readers of all ages have and are enjoying it. O. Warfield: Led By An Eagle has leader Omar Blue taking his Pack into the mountains to meet his kin. K-9 Town is full of excitement. Though reluctant to leave their beloved K-9 Town, USA the pack sees this as their chance to find out more about their mysterious leader whom they have grown to love and respect. A leader who makes each of them feel a part of something wonderful and invincible. But … just before their departure, Rottweiler Brady has a confrontation with Mountain Lion Booby while he and Pit Bull Sammy are on an enjoyable morning stroll. The mountain lions’ plan backfires when Booby is embarrassed in front of his followers. Livid because “Professor” Brady had gotten the best of him, the mountain lions vow to rid “their” land of Omar Blue and his Pack, forever. They’re going to follow the pack into the mountains, picking up kin as they go. Having a ball, as Omar Blue and his Pack are known to do, even those lovable naughty puppies get into the act. The showdown is one of a kind and will have you right in the middle of the action. To be remembered as unique and I hope, powerful. This book is to be enjoyed by the whole family. What’s the hook for the book. O. Warfield: Led By an Eagle is made up of a community of diverse characters. Big, small, mixed breeds, purebreds are all the same at K-9 Town, USA. Each has its own personality and background. Love, friendship and loyalty are taken to another level. My characters know they are loved and needed and will protect each other above all else. They love the town they have founded and the way of life their leader has shown them. For this they would live or die for Omar Blue, just as he would for them. O. Warfield: My characters are imagined from real life animals and people. I put in some of the breed’s natural characteristics in most cases, then add what I need for a particular scenario. Some of my main characters belong to family and friends. My dog Omar Blue has a strong character. That’s what it takes to be a respected leader. I’m talking about a strong presence so he can lead my rottweilers, pit bulls and the others and make it fictionally believable. I built his character around his real personality. Sweet as can be but definitely an alpha. Some of my stories come from listening to people talk. Especially my naughty puppies. We all know how funny babies are when they are just learning to do things on their own. As I listen, I start formulating my stories for Omar’s K-9 Town Pack. My settings are always wilderness with trees and mountains for shelter and wide open spaces where the pack can run free and the puppies can run wild. In Led By An Eagle there are two. The oldest of the Elders. Komondor Rasta Mama who was introduced in Omar Blue and K-9 Town, USA along with her son Rasta Kooley and his family, and, Great Dane Granny who is making her first appearance. These two have special gifts. Rasta Mama has the gift of second sight. She can see bad things that are about to happen. Great Dane Granny is able to cast away evil. They have named themselves the “Seers” and plan to travel together and use their gifts and “special potions” to keep Omar’s Pack safe. O. Warfield: Do you have specific techniques to help maintain course of the plot? Maintaining the course of my plot isn’t hard because there are so many directions I can go. Just as real life takes us in many directions. K-9 Town, USA is just getting on its feet. There are many adventures ahead without changing the course of the plot. O. Warfield: Do you have a specific writing style? Preferred POV? I really don’t know if I’d call it a style of writing. I love to rhyme but I’m just addicted to writing. I entertain myself with what I write, so I hope my writing, no matter what form, is entertaining to others. My stories seem to have little lessons attached to them. I think that’s because reinforcement of good ideals never hurts. Maybe I can label that a part of my writing style because it comes naturally. O. Warfield: How does your environment/upbringing color our writing? I grew up in Brooklyn, New York and became an adult in the late 60s when “make love not war” was one of the more popular sayings. Omar Blue’s K-9 Town, USA is an example of this philosophy. They want to live in peace but will go to war at the drop of a hat. They won’t let anything disrupt their way of life and the happiness it brings them. O. Warfield: Share the best review you’ve ever had. I’m very proud of this review. My reader captured every feeling I envisioned. The review is from: Omar Blue and K-9 Town, USA. Omar Blue and K-9 Town, USA – I have to say that when I saw the book – slim in size I thought at first it was going to be detailed with facts about dogs, so thankfully it was short and to the point. I never ruffled through the book to get a glimpse of what my eyes were about to enjoy. I took it to my desk and planned to take a sneak peak. After the 3rd page I was hooked. Literally I could not put the book down – the stories are delightful, and I felt like I was right in the middle of action with the K-9’s. Darn the phone is ringing – put the book down – great wrong number – back to the stories. Before I knew it I was on chapter 8, and I decided to stop reading so that I could savor the rest of the book on a slower pace. The author made this a fun, easy to read book, and the problems presented, along with the way they were solved relate to life – trusting, leadership, teamwork, diversity and so much more. Its a great book for any age bracket. I think each age group will relate to it differently based on their own unique set of challenges. O. Warfield: What are your current projects? 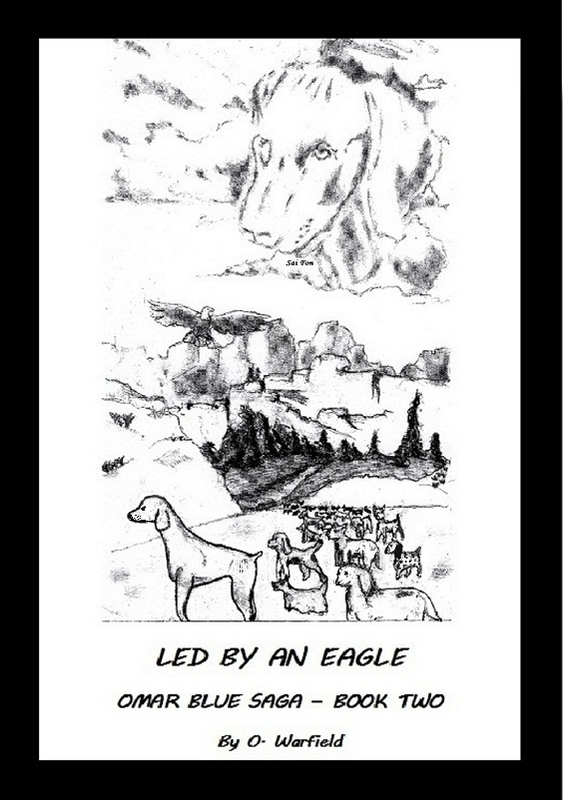 I’ve finally published the e-book and paperback versions of Led By An Eagle. It’s now available on Amazon.com. I’m on cloud nine about that review I mentioned above but I know this is only the beginning. Writing is the fun part. Promoting is serious business. A never ending project of mine is working with an agency called Fetch A Cure. Through community outreach by way of events, campaigns and fundraisers, FETCH works to promote the need to help pets live long, healthy lives. We continually work to raise awareness and further education about pet cancer prevention, detection and treatment and senior care and aging issues. I could go on and on but instead I’ll let you find out about the wonderful programs we have in place by visiting http://fetchacure.com. In addition to the above, I am now gearing up for my yearly contribution to the Combined Virginia Campaign. This is a statewide fundraising effort done by State agencies. Each year for the last eight, I’ve coordinated a spectacular talent show with proceeds going to the Sickle Cell Foundation, the first six, then we brought the money even closer to home, changing our theme to “Pampering Tots.” All funds are donated to a diaper bank program known as Capital Diaper Bank, to purchase pampers for babies in the community. This takes place mid November. Lots of fun and talent in addition to being very gratifying. O. Warfield: Where can folks learn more about your books and events? O. Warfield: Thank you again for what you are doing.